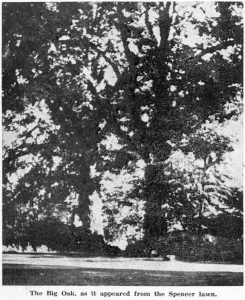 Until Wednesday of last week, two of Wayne’s best known landmarks were the twin oak trees that stood side by side on Radnor Street road, just to the south of its intersection with Poplar avenue. Many times passers-by stopped to ask Mr. and Mrs. Russell B. Spencer, on whose property these trees stood, what they knew of their history. There was little to tell, except that they were apparently of great age, because of their obvious tremendous size and height. A few years ago, two representatives from the “Philadelphia Evening Bulletin” stopped to take pictures of the trees and to ask their owner’s permission to list them in the “250 Years Old Tree Club” of the “Bulletin.” This at least gave a date of sorts for the trees. 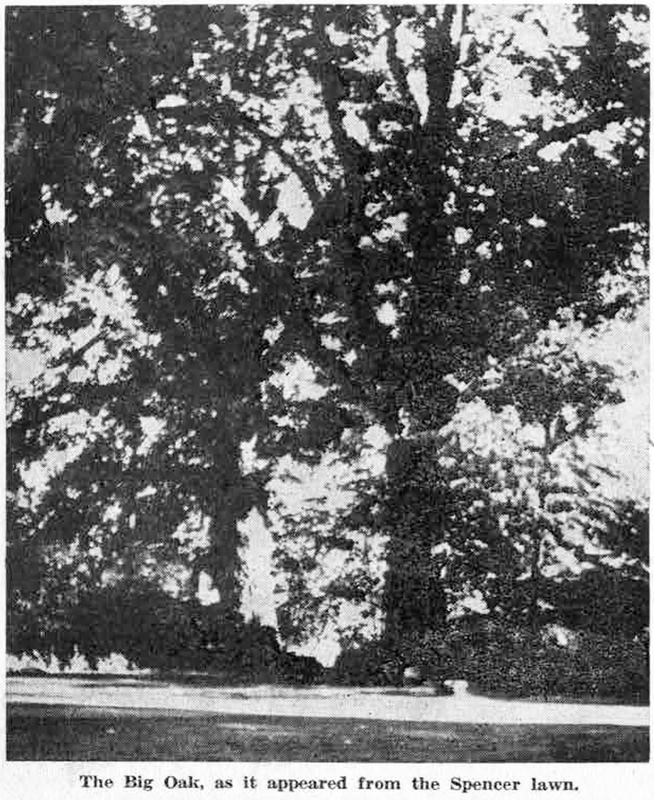 The Spencers, proud of these magnificent old trees, whose wide spreading limbs gave shade not only to their yard, but to the Cowan playgrounds and Radnor Street road, had them examined from time to time by tree surgeons to prolong their lives. Wind storms came and went, apparently without doing them material damage. Even “Hurricane Hazel,” as it cut its devastating swath through Wayne, last October, left the two trees little harmed. And then last Wednesday, as Mrs. Spencer stood at one of the windows of her home and noted the quietness of the scene along Radnor Street road – the school bus had just departed and Cowan Play Field was now empty of children – she heard a small crackling noise in one of the old oaks. With startling speed this noise grew into a great roar as the tree closest to the field crashed to the ground, sending up clouds of sawdust, almost smoke-like in their density. To Mrs. Spencer, her beloved old oak tree went down “just as if it were tired to death.” It would seem as if in the wisdom of its great years it had bided its time until there were no children playing in their favorite shaded corner of the school field; there was no school bus standing under it, and until there was a lull in the almost constant stream of traffic along the road, usually made even heavier on a hot summer day by swimmers on their way to and from Martin’s Dam and Colonial Village swimming pools. From all sides neighbors rushed to the scene, worried by the thought of the devastation that the old tree might have wrought as it fell. The heavy branches and limbs covered the area and electric and telephone wires were entangled in its reach. Hastily summoned crews of repairmen soon restored service while Radnor township workmen cleared the road for the passage of cars. By Thursday afternoon, the ten-man crew had cleared away all but the huge trunk, with one sharply pointed section pointed skyward. As a safety measure, the other old oak has also been taken down by township workmen. With the passing of these old trees. Mr. and Mrs. Spencer will miss the visitors who rang the door bell to inquire about the age and history of the twin oaks. They will remember the old German scissors grinder, coming up the road ringing his bell, who stopped to ask if he might have the “tree mushroom,” big as a football, which was growing on the old oak. They will think also of the adventuresome lad, who called the tree “magnificent” and proceeded to walk straight up one of its largest limbs before Mrs. Spencer could stop him. 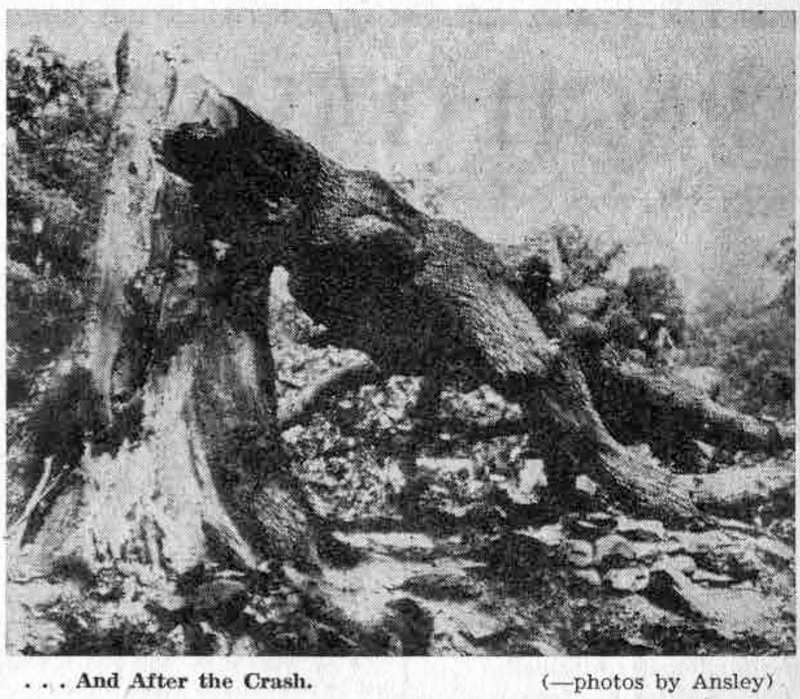 And they will remember the two occasions on which the Radnor Fire Company was called into action because of fires set in the hollow in the trunk of the one oak. The first of these fires enlarged the original hole to the extent that children could then comfortably “play house” in the old tree. And thus, with the death of these old oak sentinels, we record the passing of an era. The picture shown above was taken in 1934, eight years after the house, originally owned by Miss Emma Eldredge, passed into the possession of DeWitt P. Henry. Interesting old deeds, temporarily in the possession of the writer, show that in the years between 1881, when it was first built, and 1926, this house had passed through several ownerships. In 1946 it was sold by DeWitt Henry to his son, John Henry, who sold it to its present occupants, Mr. and Mrs. Harry Black, about six years ago. 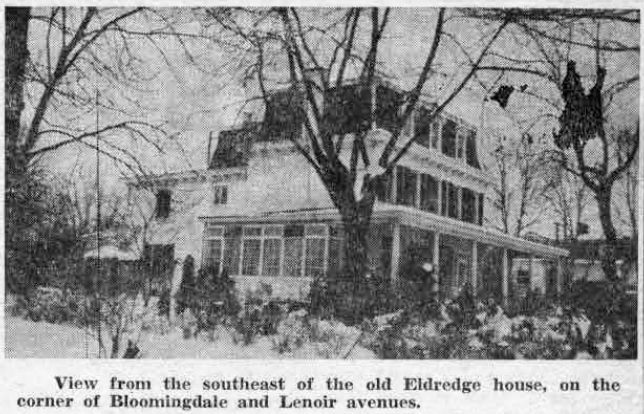 Even looking back over a 74-year period of changing real estate values in Radnor township, it is still hard to believe that Miss Eldredge paid Drexel and Childs only $6,000 for “all that certain lot or piece of ground, with the brick messuage or tenement thereon erected,” as the original property was described in the deed dated August, 1881. Succeeding deeds show a steady increase in the value of the property – in keeping with other property values throughout the township. When the DeWitt Henry family moved into the house, the blackboards used by the Misses Emma and Adelaide Eldredge, in the school they had conducted in this house for so long, still lined the walls of a large room on the north side, which the Henrys later used as their dining room. A door led directly into this school room from a pathway leading to Lenoir avenue. This door is still in use by the Blacks as a direct entrance from the outside into one of their apartments. The extensive grounds must have provided generous play space for the pupils of the school. Still beautifully planted, in spite of the ravages of “Hurricane Hazel,” they now provide individual garden space for all of Mrs. Black’s tenants. In calling attention to the rock gardens on the southern boundary of her lot, Mrs. Black explained that it is said to be part of the old reservoir which originally extended from West Wayne avenue to the north, along the western boundary of the properties in this block. If so, this rock garden is the only relic of what was once one of the main sources of water supply tor Wayne. Herman Lengel, one of Wayne’s old-time builders, described this reservoir to the writer recently as a “very handsome affair” amid surroundings so attractive that local churches held some of their outdoor festivals there. Brick steps led from the side wall of Bloomingdale avenue to the main level of the reservoir, from which another set of steps led to the top of it. Around the reservoir was a brick walk enclosed by an iron fence. The inside of the reservoir itself was also brick lined. By the early 90’s this source of water supply had ceased to be used, however Mr. Lengel also reminisced about the source of the building supplies that went into the erection of the early Bloomingdale avenue houses. He remembers that the bricks were hauled from the Florey brick yard, near Garrett Hill, by dump cart, and that the timber came from either the Tryon Lewis saw mills or from the Edwards mills. But whoever the builders, or whatever the source of their supplies, time has proved the worth of their labors in the sturdy Victorian style houses that still give shelter to many of Wayne’s families. Because the front door at 114 Bloomingdale avenue already stood open for the writer, as she rang the door bell one day last week to keep an appointment with Mrs. Harry Black, the spirit of hospitality seemed at once to take possession of the coming interview. For it was in this spirit of hospitality that Mrs. Black showed her home on that morning. Like all of its one-time neighbors on both sides of Bloomingdale avenue, between Lancaster and West Wayne avenues, the Black home is a part of Wayne’s earliest building operations, started in 1880 by Drexel and Childs, on land purchased from Henry Askin, often called the founder of Wayne. In the 75 years since they were built, these large houses have seen many changes. Two of them, the James homestead on the northeast corner of Bloomingdale avenue and the Pike, and the Fox house, next door, were torn down years ago to make room for the Kingsway Apartments. 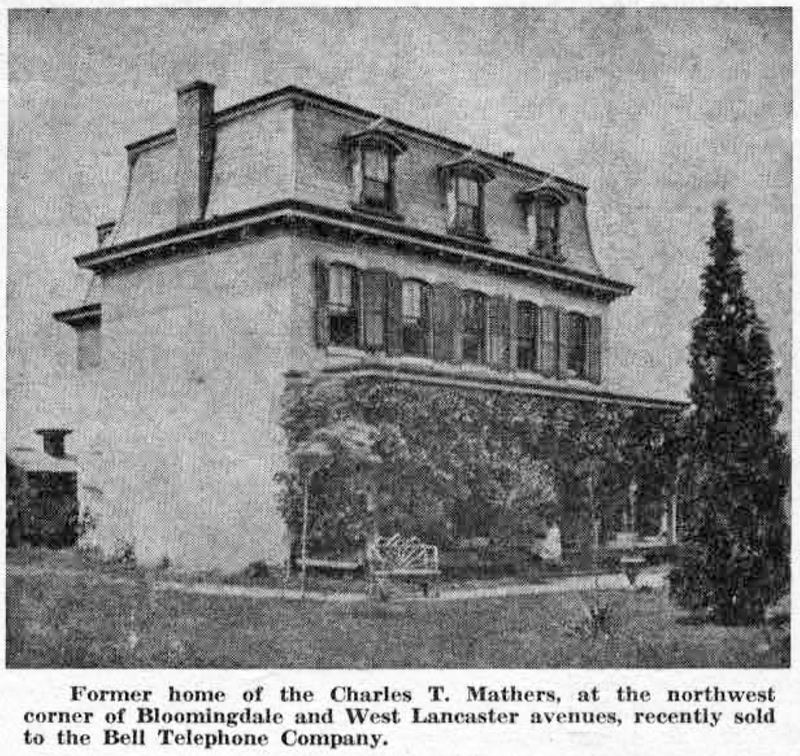 Last week the imminent demolition of the Charles Mather house, where the new Bell Telephone Company office will be erected, was noted in this column. Since the other Bloomingdale avenue houses of the 1880’s are farther away from that great artery of traffic, Lancaster avenue, their span of life is being lengthened. While some of them are still one-family homes, others have been made into multiple family dwellings. It is the latter plan that has been followed for two of the houses recently visited by the writer. In one, Mrs. Henry G. Fischer has retained the first floor of her home, set in the midst of its famous garden, for her own use. Above the first floor are apartments for tenants who may enjoy the beauty of the outdoor surroundings, just as Mrs. Fischer does. On the same side of the street, across Lenoir avenue, Mr. and Mrs. Black bought, six years ago, the house originally owned by Miss Emma Eldredge, who purchased it from Drexel and Childs in 1881. Here she and her sister, Miss Adelaide Eldredge, conducted a well known private school, which was attended by many of Wayne’s present old-timers. In the front part of the downstairs occupied by Mr. and Mrs Black, the big fireplaces with the old French mirrors above them, the living and dining rooms, are reminiscent of the period in which the house was built. A door in the dining room opens onto what was once a sun porch when Mr. and Mrs. DeWitt P. Henry, parents of John Henry, owned the house. The Blacks have panelled the room in light wood, in pleasant contrast to the deep red hangings at the windows. Here a door leads to a small patio with a white picket fence and trellis, forming the corner of the house, shown in today’s picture. Within the enclosure is a lovely rose garden, some of it planted years ago by former owners of the property and now carefully tended by the Blacks. Although the recent hurricane took heavy toll of the old trees in the big yard, there are still many left, including a magnolia tree carved with the Henry children’s initials. This custom the Blacks are continuing, by having their children and grandchildren in turn carve their initials into the same trees. 1880’s photo of Theodore F. Ramsey, then son Charles T. Mather home: corner of Bloomingdale and Lancaster Aves. ; drawing of the Bell Telephone Company building to replace home in 1956. In all Wayne there are perhaps no two pictures that illustrate as strikingly the changes that the last 75 years have wrought in our community as do the two shown with this week’s column. The first is that of the Charles T. Mather home, recently sold to the Bell Telephone Company, as it looked in the early 1880’s. It belonged then to Mrs. Mather’s parents, the Theodore F. Ramseys. If plans go according to the Telephone Company’s schedule, as recently announced by Herbert J. Bruder, district commercial manager, the construction of a new dial office on this site will begin today. Completion of the building is scheduled for December, 1956. The first step in the building program will undoubtedly be the demolition of the Mather home to make room for the new building. The original owner of this handsome Bloomingdale avenue house, with its mansard roof, so typical of the homes of the latter part of the 19th Century, was Dr. Wilson, who had purchased it from George W. Childs and Anthony J. Drexel, of Philadelphia. These two men, who foresaw the possibilities of suburban housing for Philadelphia business men and their families, might well be called the first real estate promoters of Wayne. They were responsible for the building of all the original homes on both sides of Bloomingdale avenue, between Lancaster and West Wayne avenues. Concentrated in this area, the homes antedated the well-known Wayne Estate houses by about 10 years. Her father, according to Mrs. Mather, “farmed most of what is now North Wayne.” However, the inconvenience of driving along unpaved roads, when wagons were “hub deep in mud” made a more conveniently located home almost a necessity. When Dr. Wilson was forced to sell his Bloomingdale avenue home at sheriff’s sale, the Theodore Ramseys bought it for $3,500! Seventy years later this is an almost unbelievable figure, in view of current Lancaster avenue property values. 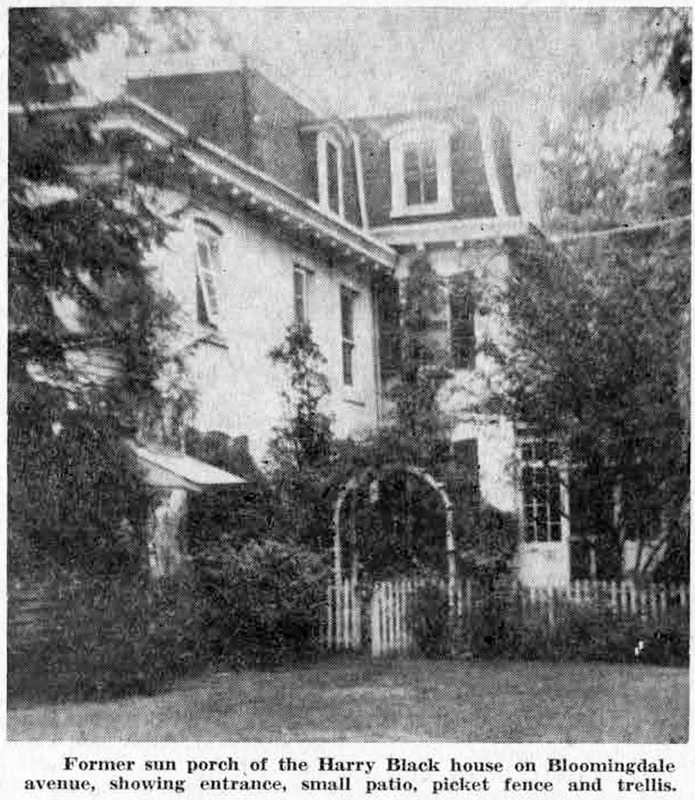 When the Ramseys bought this house they were living on their farm on the corner of Beechtree lane and Bellevue avenue, now owned by Miss Dorothy Finley, who has given space in it for the Headquarters and Museum of the Radnor Historical Society. The picture in this column shows the Ramsey home as it looked during the first years of its occupancy by the family. The woman shown sitting on the steps of the front porch is Mrs. Ramsey, with her baby daughter, Ada, now Mrs. Mather. Later changes in the house provided more depth, with the old-fashioned kitchen made into a dining room and a new kitchen added to the rear, with corresponding second floor changes. The steep, narrow staircase that led almost directly from the front door to the second floor was widened and a turn made so that it led into the living room. In 1907, when the Ramsey estate was settled, Mrs. Mather bought the share of it inherited by her sister, Mrs. DeWitt Pugh, who now lives on Croton road. 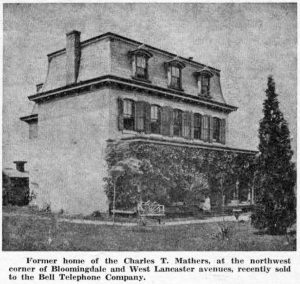 The Mathers lived continously in the old home until its recent sale to the Bell Telephone Company. The new $325,000 structure planned by Bell will be fire-proof construction with brick walls. It will house the dial central office utility area, lunch facilities, meeting room and service center. It will also have a cable vault below street level. Residents owning pictures, old deeds or other information that will aid Mrs. Patterson in continuing the story of the Bloomingdale avenue houses, can contact her at Wayne 4569.